Well I am continuing my ‘Outlander” Christmas theme this year with a bit of Scottish style thrown into the mix. If you missed the living room Christmas tour, you can find it HERE. 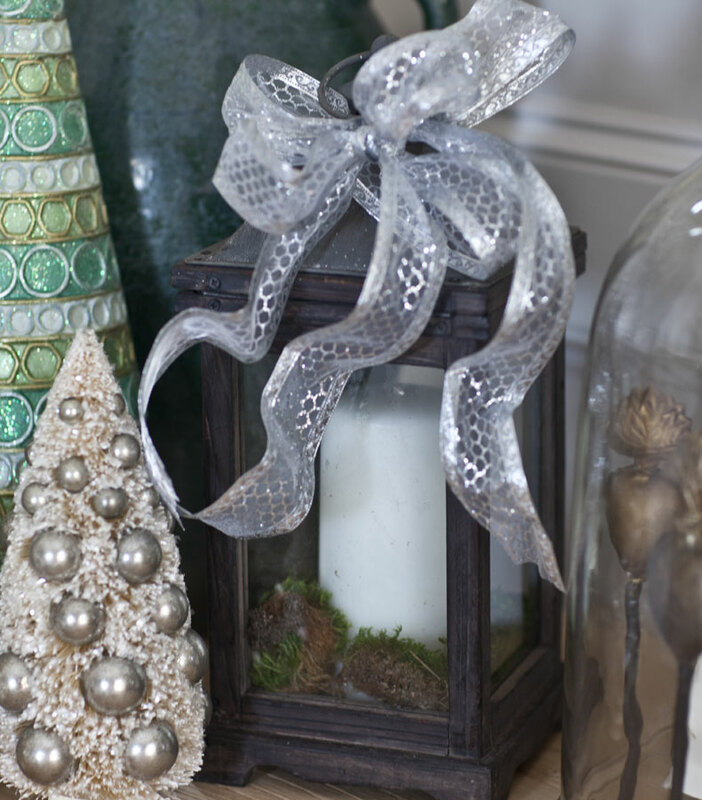 The trick for me is to add some Christmas touches without spending too much time or money on the holiday decorating. When the season is over, we have to store those things and we have to pay for them. So why not go easy on yourself? For my shelf I added a tartan ribbon bow and a boxwood wreath. The candlesticks are antique porch balustrades. I moved the Santos here since I thought he (or maybe it’s a she) fit right in with the season. 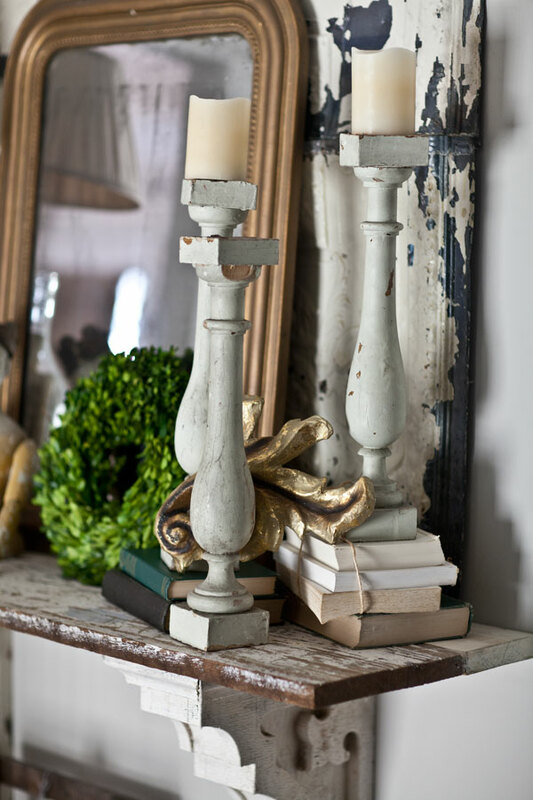 Just look at all of those vintage touches from the crackled paint finish of the candlesticks to the old original 19th century Louis Philippe mirror. 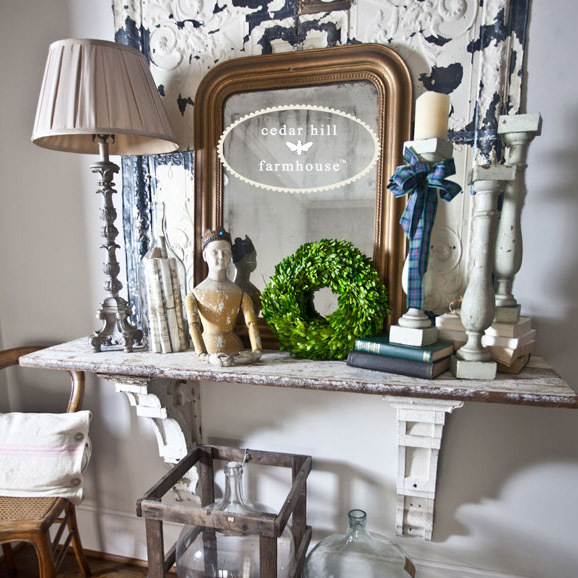 We also have the boxwood wreath texture and the antique ceiling tile tin on the wall with it’s chipped paint. Even the shelf itself and the corbels holding it in place are over a 100 years old. When I had the shelf made, I used these antique materials and everything was not exactly the size I needed. If you look closely at the shelf you can see we added a board to it (next to the wall) to make it deep enough. 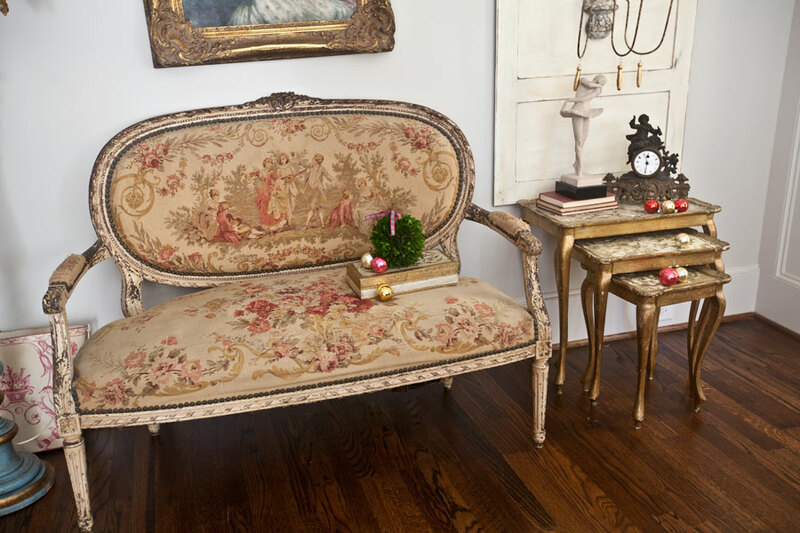 In my bedroom upstairs as a nod to the season I set out a gold Florentine box with a preserved boxwood wreath and some Christmas ornaments on my antique French settee. I also added a few more ornaments to the Florentine nesting tables. Each year I buy new ribbon and that is what I use to define my theme each year. This year I also bought these really pretty tall green Christmas trees and the white bottle brush trees with the silver ornaments. I was going to carry the tall trees in my shop, but the supplier sold out. I did carry the bottle brush trees but I believe they are sold out. 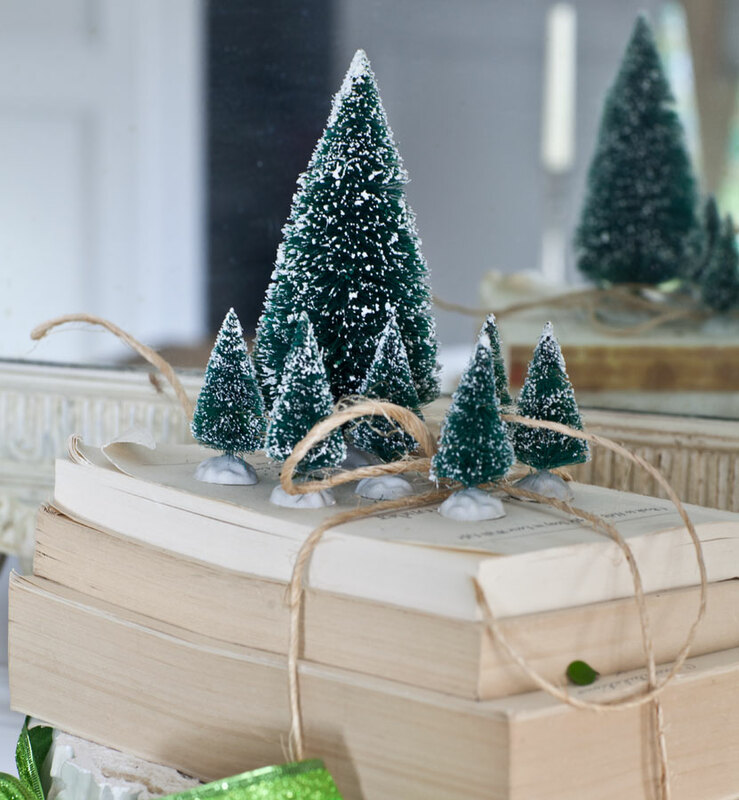 Now my philosophy is to start with really quality items and just add touches of Christmas to your room. 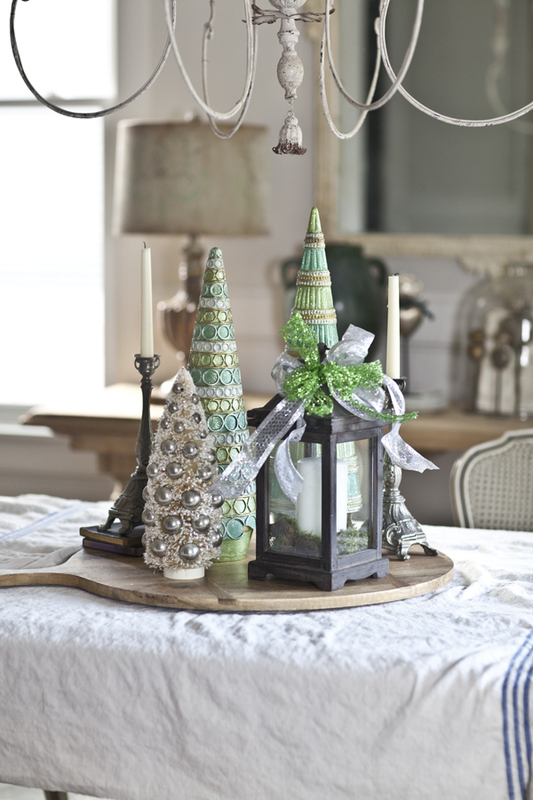 If you have gorgeous items that stand on their own, you don’t need to add a lot of Christmas details. And wouldn’t you rather spend your money on the stuff that you keep out year round rather than things you only pull out for a few weeks every year? Below you can see those green trees and a few of my other bottle brush trees on the dining room table. These bottle brush trees were a purchase from last year but see how well they go with the trees from this year? I’ll use these again probably next year. 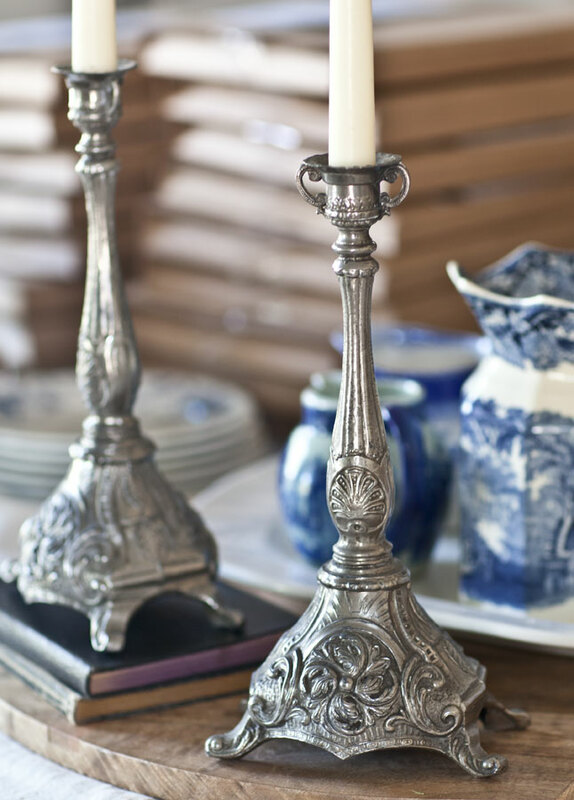 My point about using quality items to begin with can be made with these candlesticks I bought to sell in my shop. Well I ended up keeping these because they were just so beautiful. Can you blame me? 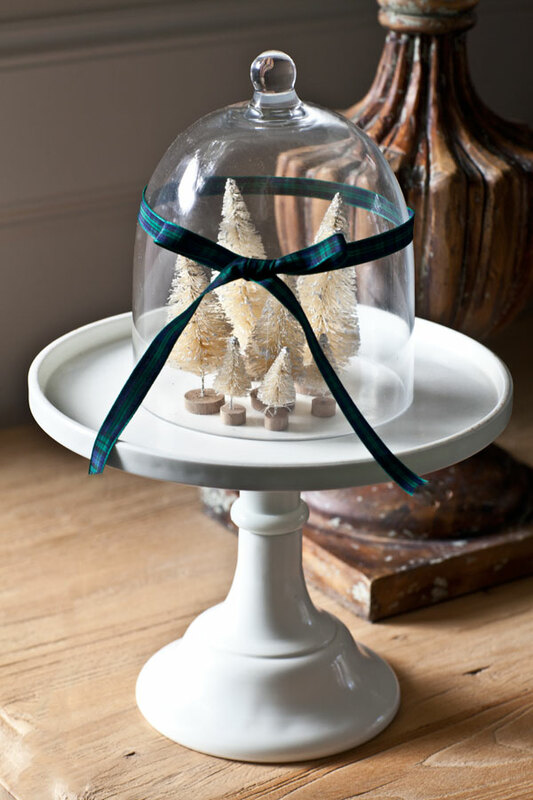 Here I used several small bottle brush trees in a miniature cloche and tied some tartan ribbon around it. The cloche and cake stand can be used later for any season by changing out the ribbon and what I put inside. The same goes for this amazing column base. This thing is very old and heavy. It’s pretty big too, but I was so fascinated with it. These are difficult to find and I thought I had to have it. To make it look Christmas-y, I added the preserved boxwood ball with more tartan ribbon and a big shimmery chartreuse green bow. I won’t be putting this column base away after the holidays. I can simply dress it up for whatever season or holiday I want to or simply leave it unadorned. It’s pretty enough to be left plain. 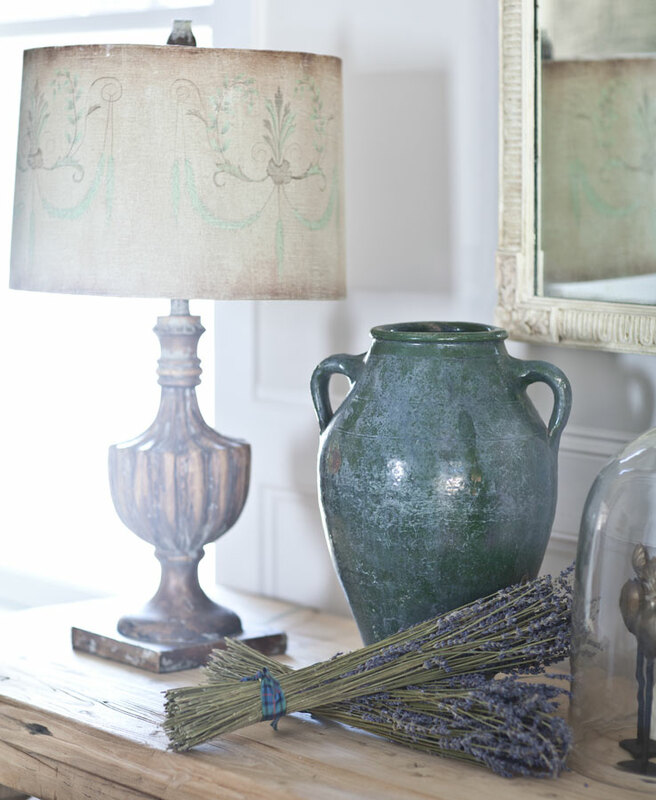 The other recent addition to my dining room is this antique olive jug. The patina is so amazing and it’s got some chipping here and there. I don’t mind because that speaks to its age. I added a few bundles of dried lavender wrapped with more tartan ribbon.The tartan pattern is Flower of Scotland. This is a gorgeous piece I’ll keep in here year round, and I can dress it up for different holidays if I want. But it has such presence, and it’s just too beautiful to put away to make way for cheap Christmas decorations. I added more bottle brush trees on top of these books tied with twine. And finally I’m using these pretty lanterns in my home. They are not expensive but as I have been saying they will work for any holiday or season. 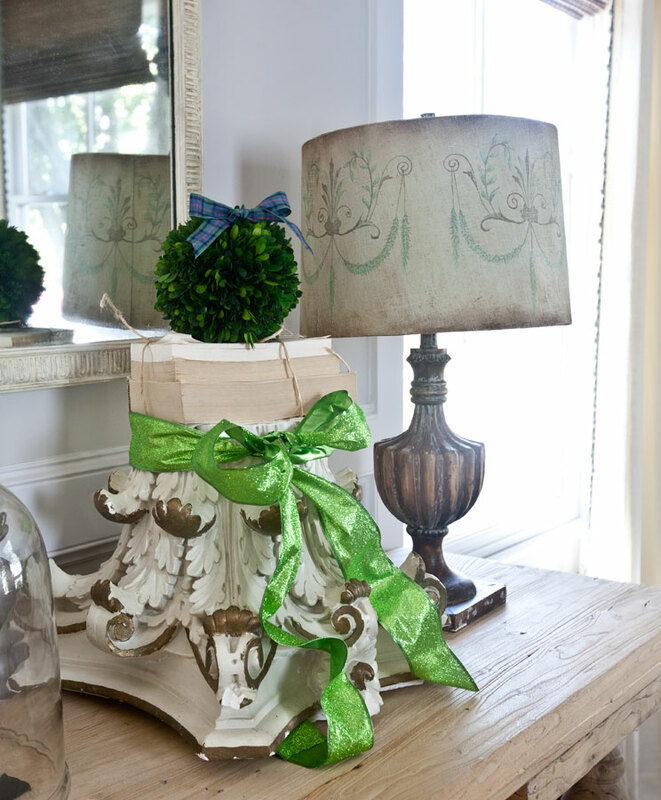 You simply add a different ribbon, or some greenery from the current season and you have a totally new look. I have these in my shop. I hope that has given you some ideas for your Christmas decor this year. So spend your money on timeless decor that you can use year round, then just add some Christmas touches with ribbon and a few things added in for a simple, elegant and beautiful look every tme. Every time I see your Santos doll I want to get one! Love all your bottle brush trees! They’re my fave this year. Thanks for joining the tour, Anita! I spy books on a chair…heresy!! Looks beautiful. Your bottle brush trees are amazing! Love your decorating style. And it’s so true that it’s better to buy some quality items and just place some little Christmasy items around those. Who wants to store all those Rubbermade boxes anyhow! Everything looks beautiful Anita. I am using a lot of natural pieces this year too. I think your seasonal decorating philosophy is spot on Anita! And everything in your entry looks just beautiful. Lovely! I love all of your trees and simple Christmas touches! Your home looks absolutely gorgeous Anita! Love your beautiful yet simple touches. And yes using what you already have is perfect!! Merry Christmas! I love the Christmas ‘touches’ throughout your home decor, dear friend!!! I, too, try to use my everyday things all spruced up for Christmas and other holidays throughout the year!!! So pretty and peaceful looking. Love all the mini Christmas trees! Thanks for sharing! he, she…it’s all gorgeous. Merry Christmas to you and your sweet family. Hope to see you in 2016. 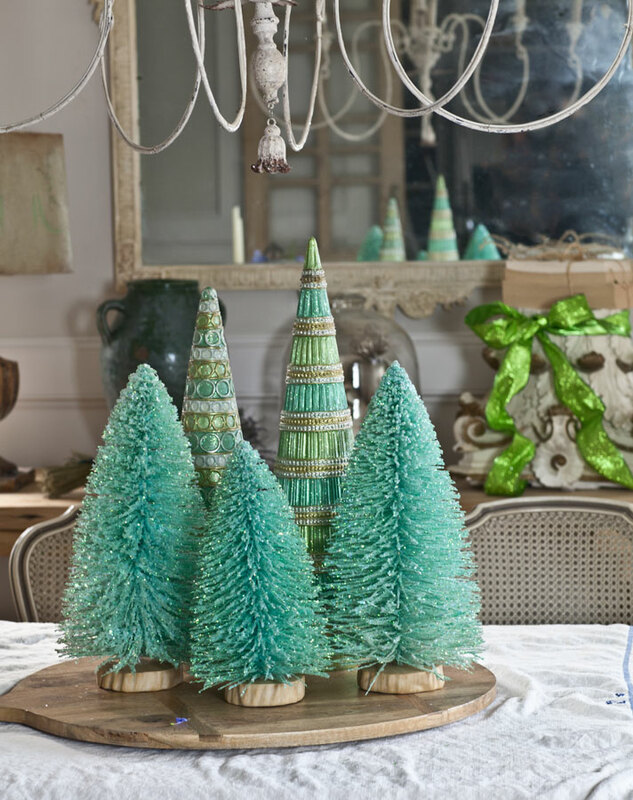 Your home is so beautiful in an understated, elegant way – I love the mini Christmas / bottlebrush trees & the way your integrate your normal things in to your decorated home. Everything is so pretty. Thank you for sharing your vignettes and pictures.